The fifth annual Terre Haute Polar Plunge is scheduled for Saturday, Feb. 9. The fundraiser for Special Olympics Indiana will take place on Hulman Center's south patio in conjunction with Indiana State University's annual Sycamore Hoopla weekend. Check-in begins at 8 a.m. with plunging beginning at 9:30 a.m. The Terre Haute plunge is sponsored by Hulman Center, Indiana State University, GFS Marketplace, IHOP, Walmart, Complete Outdoor, Mix FM, WTWO/WAWV and Sodexo. Participants can register as individuals or as part of a team or company. 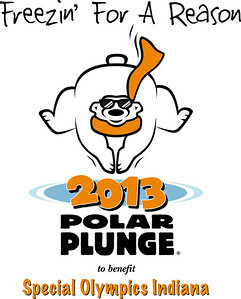 Participants must raise a "bear" minimum of $75 to plunge ($50 minimum for students with a student ID). All proceeds will benefit Special Olympics athletes, giving them the opportunity to train locally and compete at the state level in a variety of Olympic-type sports. Dust off the swimming togs, find a pair of old tennis or water shoes, grab a friend and start planning your costume! Don't forget to bring a robe and towel! Plungers will compete for awards for the best costume, most money raised by an individual, most money raised by a team and a special Campus Challenge award for the largest campus group of plungers. The Terre Haute plunge is part of the College Challenge. Indiana State is competing against Butler, Purdue, Indiana, Ball State and Valparaiso universities to raise the most money and for bragging rights. All proceeds will benefit Special Olympics athletes, giving them the opportunity to train locally and compete at the state level in a variety of Olympic-type sports.By taking the plunge, participants will support sports programs for Hoosiers with intellectual disabilities and a better way of life for nearly 11,000 Special Olympics athletes in Indiana. Special Olympics Indiana began in 1969 through the efforts of two Indiana State University faculty members. Indiana State has played an integral role in the history of Special Olympics Indiana, hosting the Summer Games 41 out of 43 years and hosting the organization's Men's State Basketball Tournament since 1971. To participate, register online at www.soindiana.org . For more information, contact Paula Meyer, ISU Communications and Marketing at 812-237-3783 or check us out on Facebook at http://www.facebook.com/THPolarPlunge . The fifth annual Terre Haute Polar Plunge is scheduled for Saturday, Feb. 9. The fundraiser for Special Olympics Indiana will take place on Hulman Center's south patio in conjunction with Indiana State University's annual Sycamore Hoopla weekend.